On a recent holiday to see our daughter Paula and her husband Ian who live in Valencia, Spain she arranged for us to visit a live steam club in Riba Rojo. We were greeted by Esteban who spoke odd words of English but Paula was able to translate for us . 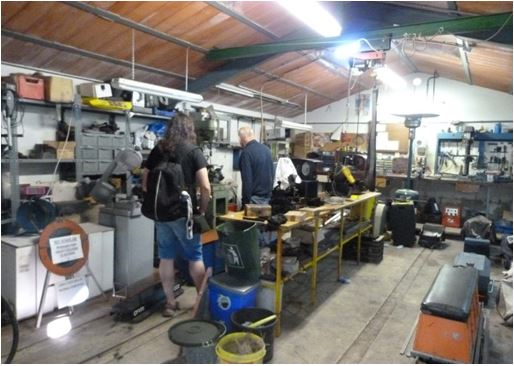 Esteban showed us the warehouse/ workshop which was very impressive not only for the range of machinery but also the cleanliness and storage for members and club locos. The riding trollies were very colourful and had been built in such a way that they could be stacked for storage. 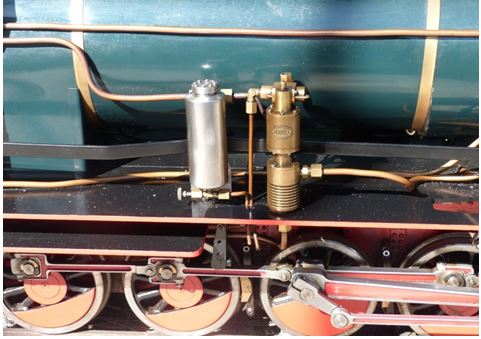 controlled by a pulse width modulator unit to control the speed of the loco. 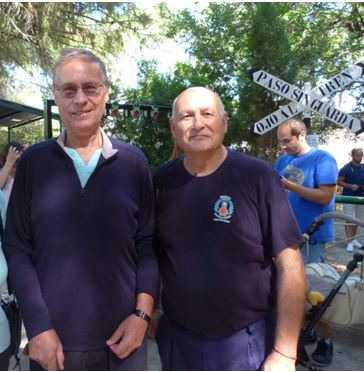 After spending about 20 minutes with Fidelio we were then introduced to the president of the club, Fernando who was able to tell us about the set-up of the club which is run as a charity and is in a small park and funded by the local municipal (council), it has approx. 650-700 metres of track running through trees and passing 2 large ponds. The trains circulate in both directions so there is a communication system between the 6 stations with a set of LED signals at various points along the track and guards at every crossing for safety. There were many ladies present helping run the station, drive loco’s as well as helping with maintenance of the engines and riding trollies. Fernando then offered us a coffee in their club room which also has a fully fitted kitchen with fridge freezer and cooking facilities. 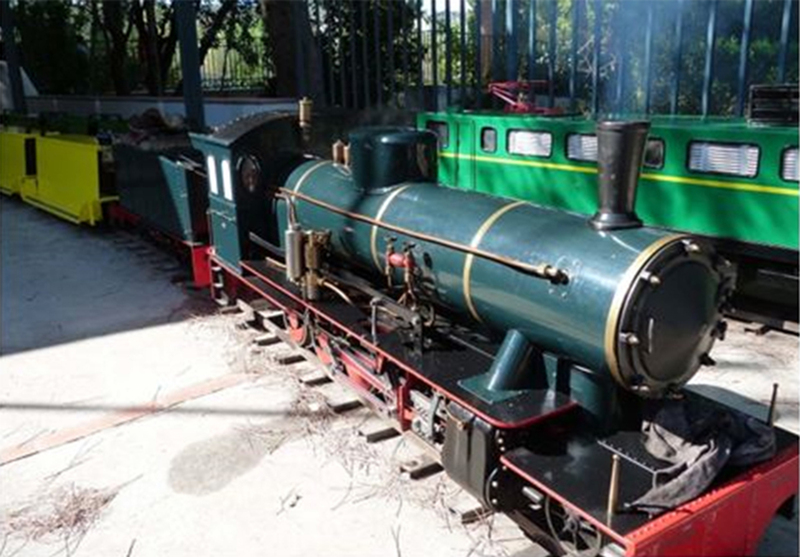 We were then asked if we would like a ride on a steam loco which was owned by Juan and took him 3 years to build. 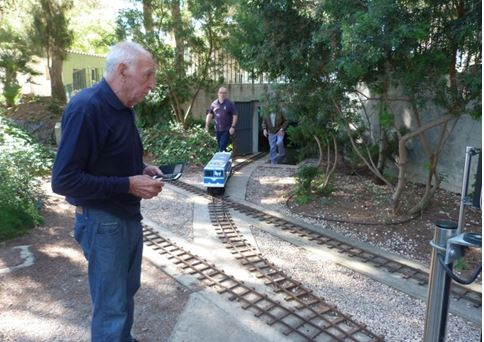 While waiting for the loco to come back into the station we counted 4 electric locos with 8 riding trollies each being loaded with passengers plus there were 2 more locos driving around the track. 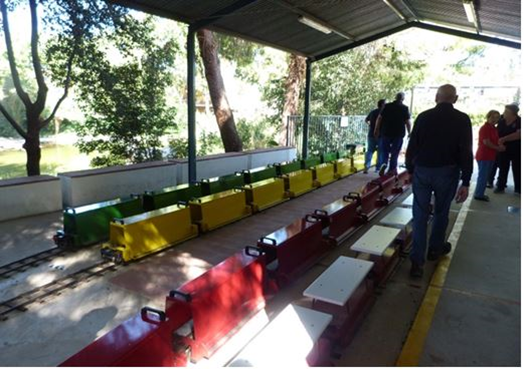 The riding trollies carry 2 adults or 2 children and I adult; Children are not allowed to ride on their own. The trip around the track was very smooth because of the concrete foundation strip that the track was on; the track was made of the same material as ours all welded construction. 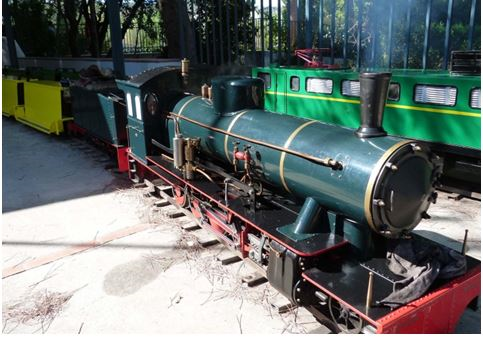 Juan spoke no English and I spoke no Spanish but we understood what each was saying about the locomotive which was a 2-10-0 tender coal fired steam (vaporista) and had a steam operated water pump which he had made and was very proud of. See photo below. 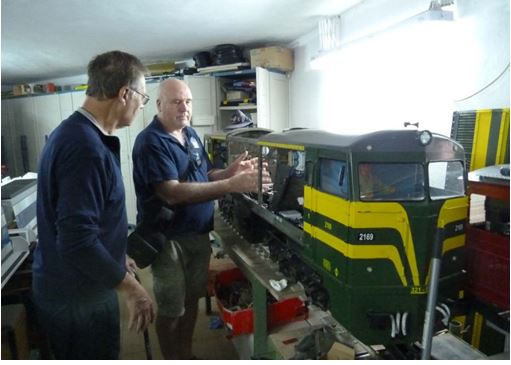 Juan and Paul – language is no barrier for like-minded model engineers. Esteban shows another entrance to the Workshop/storage area. The trains only run on Sundays between 11a.m. and 1.30p.m. and the local Mayor has asked for more running time , but the members have refused as it is manned by volunteers. During 2016 they carried approx. 40,000 passengers at 2 Euros for adults and 1 Euro for children. 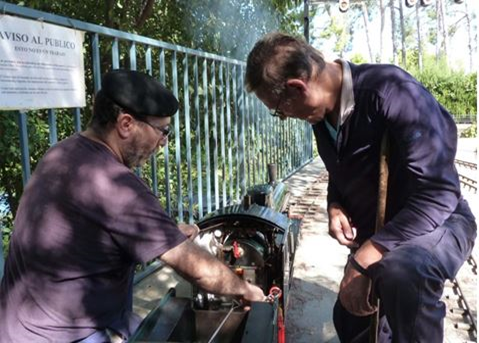 We had a very enjoyable afternoon and have an open invitation to return next year with an offer of driving a steam loco which Paula will be arranging for us.